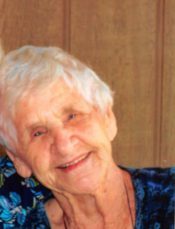 Rebecca Aldridge of Pensacola passed away on Saturday April, 06 of 2019 at the age of 103. She was born in Ripley TN, she grew up in Kosciusko MS, where she married Marshall Aldridge and raised her family there and also in Itta Bena MS.
She later moved to Pensacola after the death of her husband. She worked for Krispy Kreme before retiring. She was an avid bell collector and loved playing games with the family and friends. She is Preceded in death by her husband, 4 sons and 1 daughter. She is survived by 6 daughters and 2 sons. She had 20 grandchildren and many Great grandchildren, Great-great grandchildren. Mother faithfully had her church services every Sunday at 11am watching Olive Baptist Church. For many years she wanted to meet the “Fiery red head”, she got that wish on September 9 of 2016, She was so blessed! Following that moment the Joy Sunday school class lovingly adopted her. A visitation will be held at Pensacola Memorial Gardens on Tuesday April, 9th at 1:30 PM with a service at 2pm with Pastor Ted Traylor officiating with a burial to follow. In lieu of flowers donations can be made to Olive Baptist Church. Fly high Granny!!! I’ll miss you terribly!! I will cherish our time we worked together, my memories of you not letting me BINGO, I could go on and on!! Your time is done here, what a time you had, i know you are whole again! !